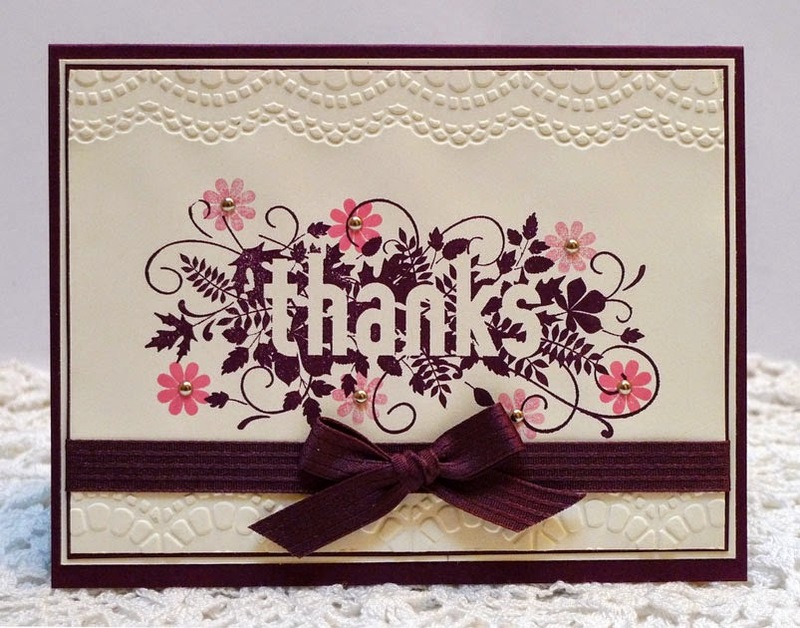 For the Mojo Monday sketch challenge this week I used Stampin' Up! 's Googly Eyes stamp set on a Crumb Cake base with Authentique Halloween paper. The twill tape is retired SU. 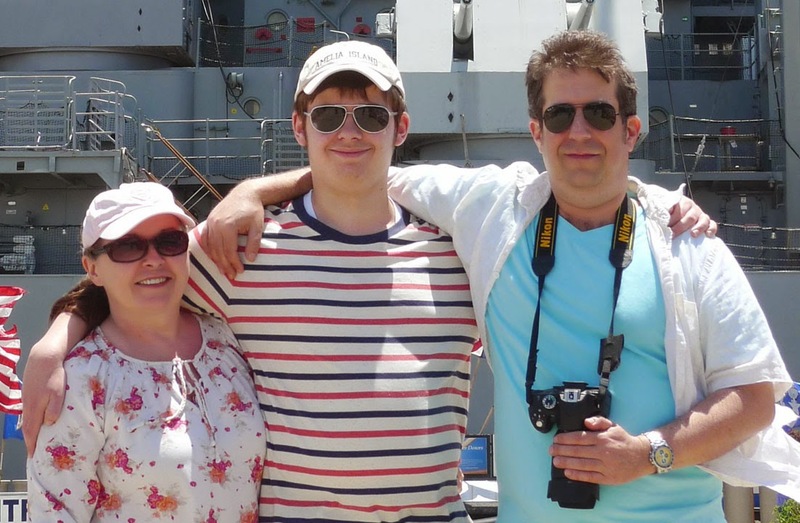 It would be awesome if every ingredient that I wanted to use to create what is in my head was available at the same time from Stampin' Up!, but that never seems to be the case. 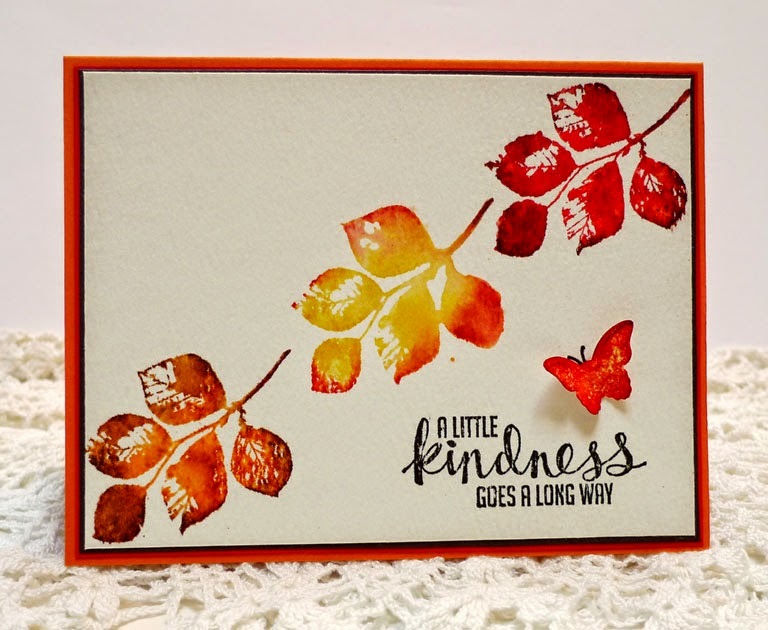 I loved the old SU copper embossing powder and cording, it is so lovely for autumn. 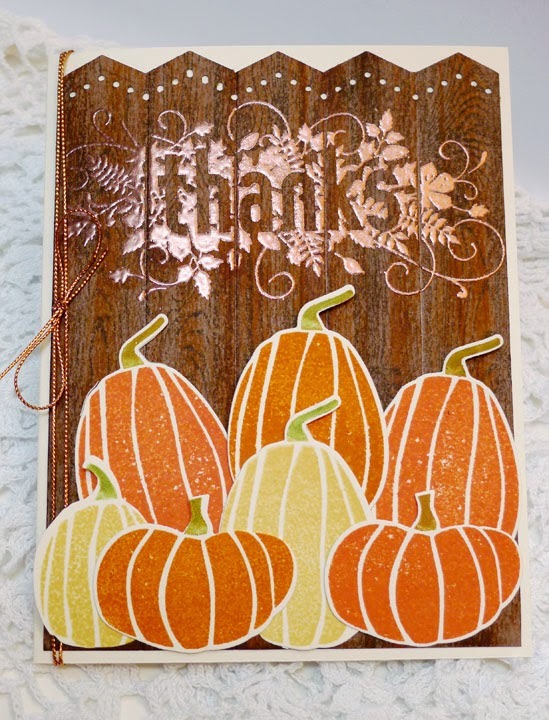 I embossed the Seasonally Scattered thanks on the Wood Grain background (top border punch is Martha Stewart), and used the Fall Fest pumpkins and Fall Fun dies in Saffron, Pumpkin Pie, and Tangerine Tango. Very Vanilla base. 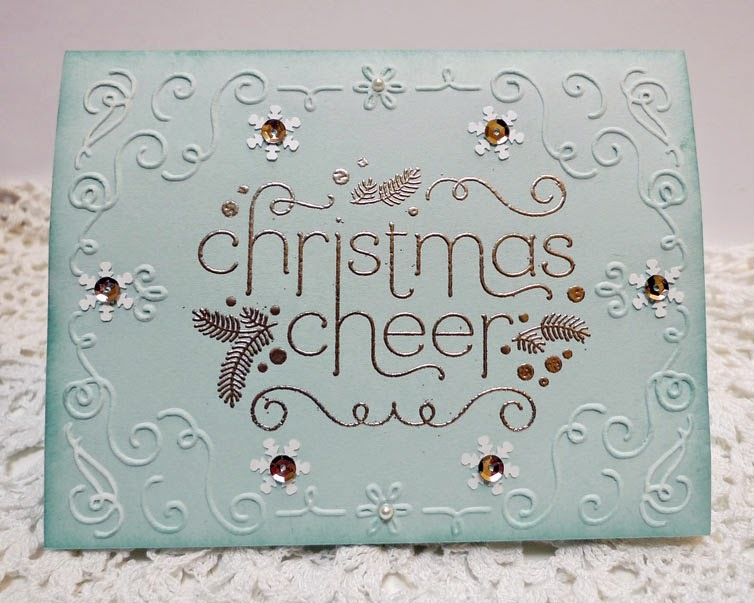 Cheerful Christmas on Soft Sky cardstock with new embossing folder and Frosted Sequins. Embossed with pewter powder. 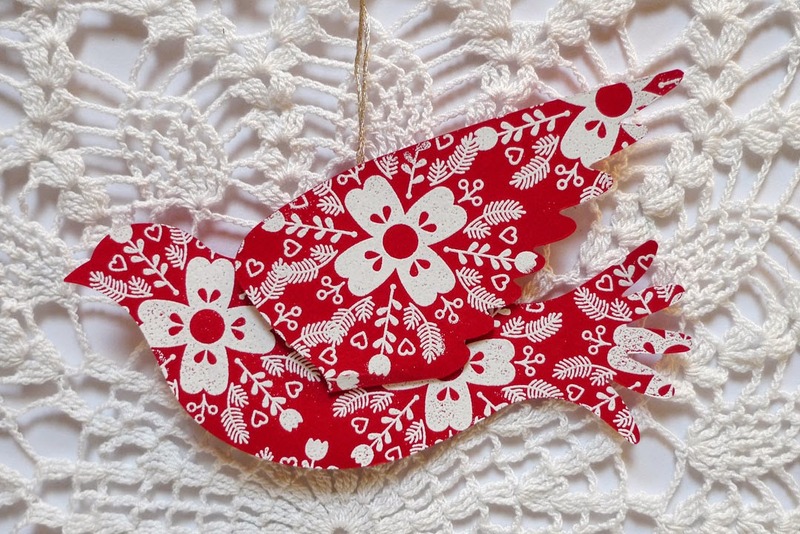 The Bigz die Elegant Bird (Had to have it and never used it until today :) in Real Red with Cheerful Christmas embossed in white. 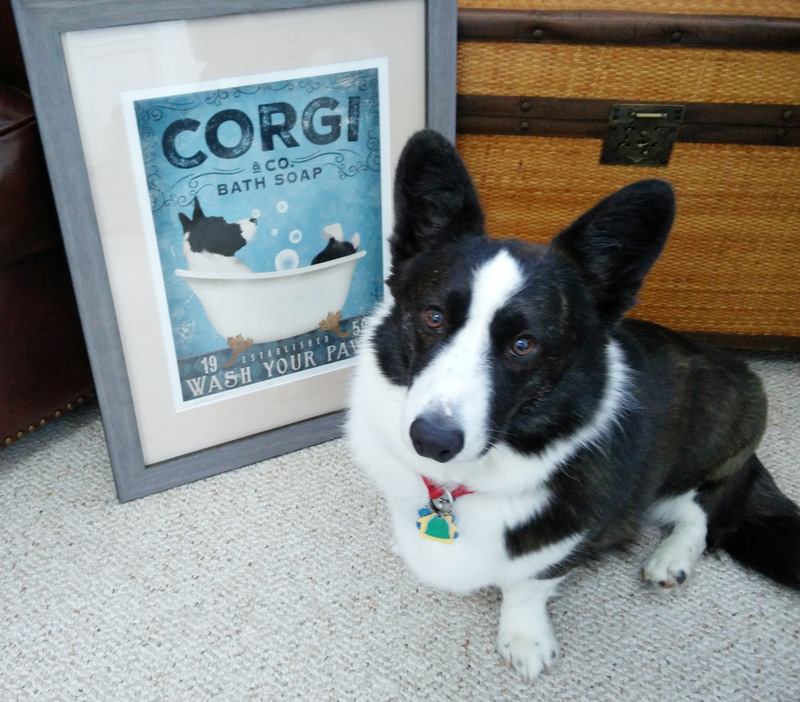 Punched a hole and used silver cross stitch thread to hang. 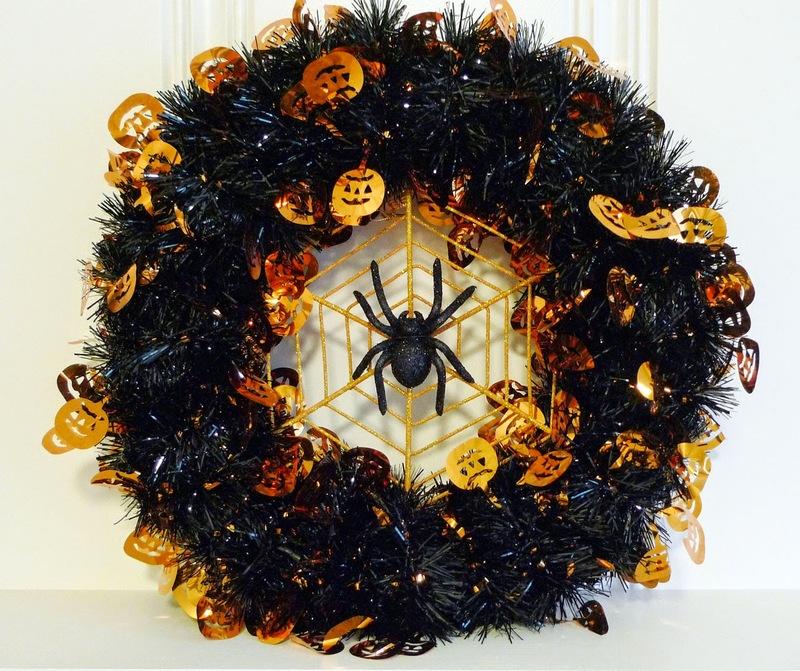 A super simple Halloween project using a styrofoam wreath ($5 at Joann's), spider on web ($6 Joann's) and two lengths of Halloween tinsel garland from Wal-Mart ($2.44 each). The lights reflect very nicely from the pumpkins and it looks better in real life. All Stampin' Up! Googly Ghouls stamp set with old spider wheel on Pear Pizzazz cardstock with a Blackberry Bliss scalloped edge accent, Saffron banner and googly eyes. Stampin' Up! Seasonally Scattered in Blackberry Bliss (ink, cardstock, and ribbon). Added some small flowers from Hello There in Strawberry Slush. Scallop edge embossing strip folder for edges and min silver brads for flower centers. All current SU. Today I am working with the new washi tape All Is Calm from the mini catalog. 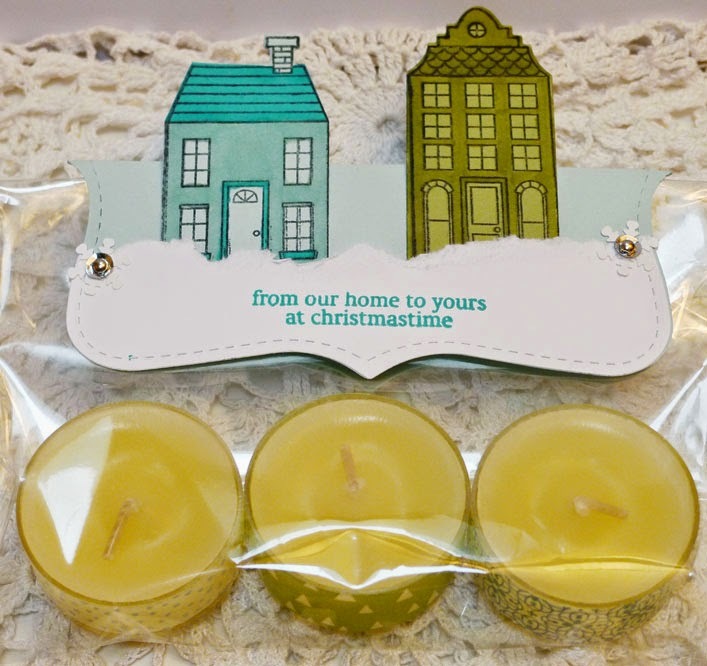 I used some tea lights and easily covered them with the tape and packaged in a cello bag with the Holiday Home set, Top Note die, and Frosted Sequins. The cello bag is a recycle, one of the die sets came in this bag and worked just fine for this. 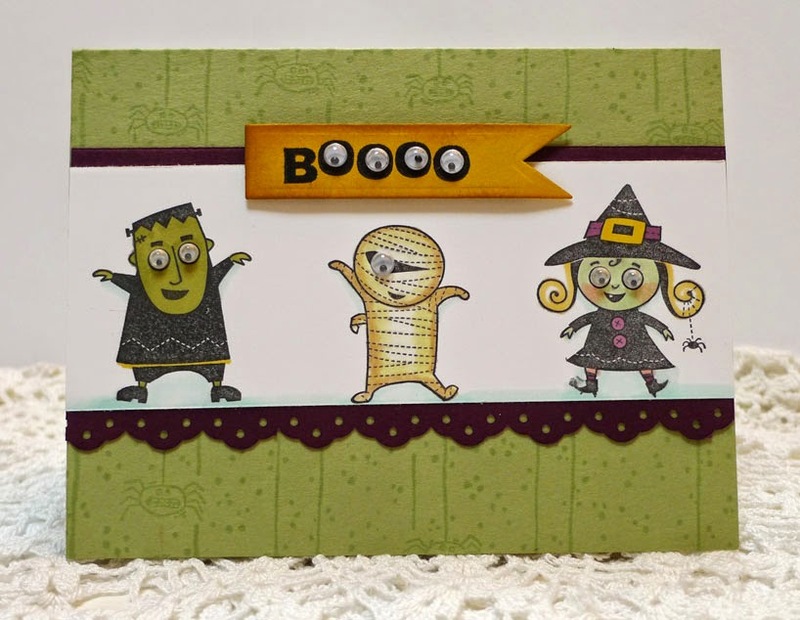 For the Mojo Monday sketch challenge I used all Stampin' Up! supplies. Nordic Noel paper with Pool Party, Real Red, and Whisper White cardstocks, Perfect Punches with scallop punch for sentiment and the new Real Red ribbon from the holiday mini catalog. 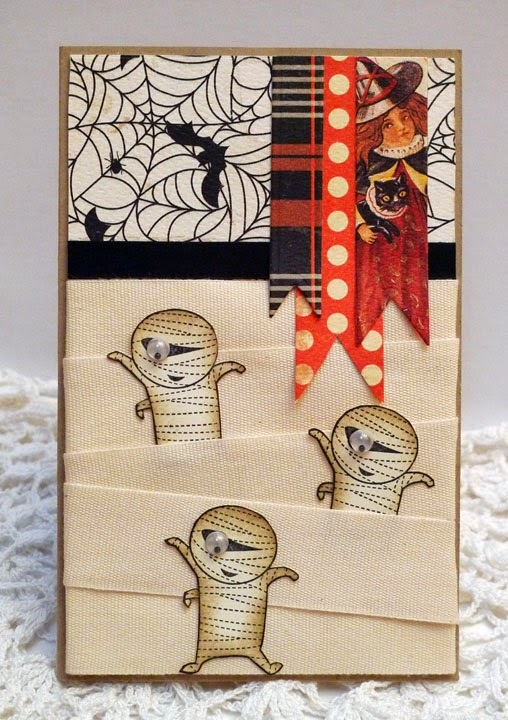 A quick little Halloween treat holder using Stampin' Up! 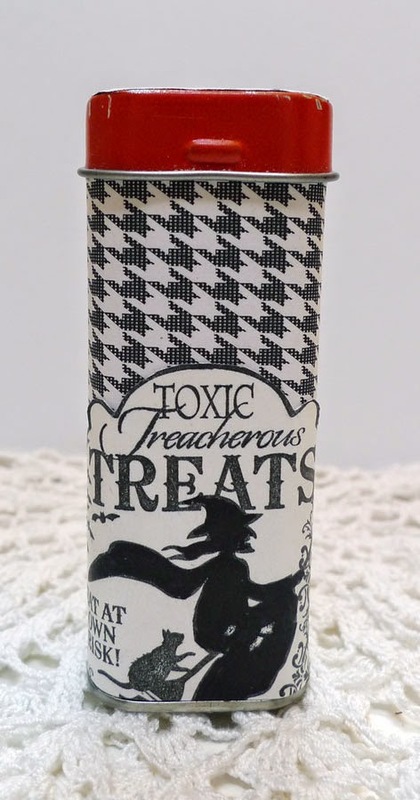 's Toxic Treats stamp set, retired paper. Tin from Trader Joe's. Looking forward to working with the new set Seasonally Scattered. Love the sentiments. 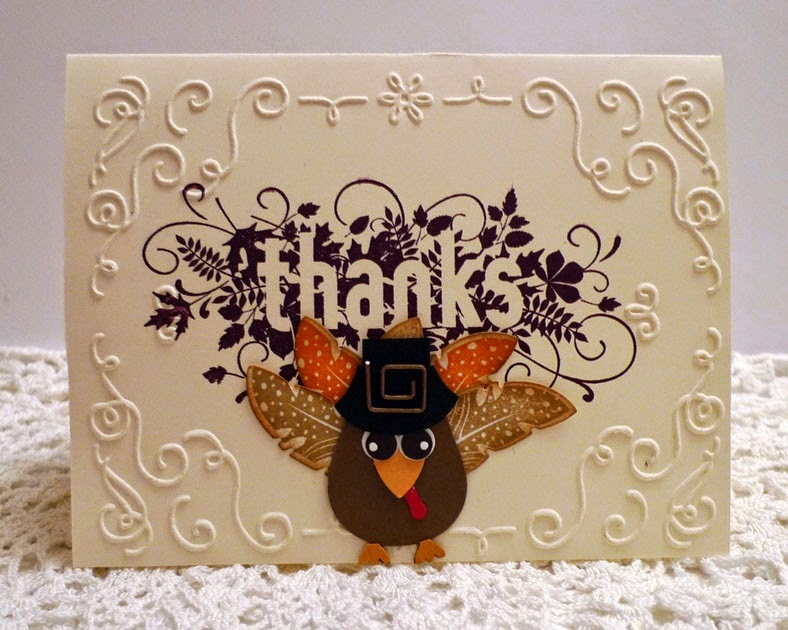 This one uses Blackberry Bliss ink and the new embossing folder from the holiday mini along with the feather set and coordinating dies. The funky looking turkey was made using the owl punch. Ruby Red Slippers! 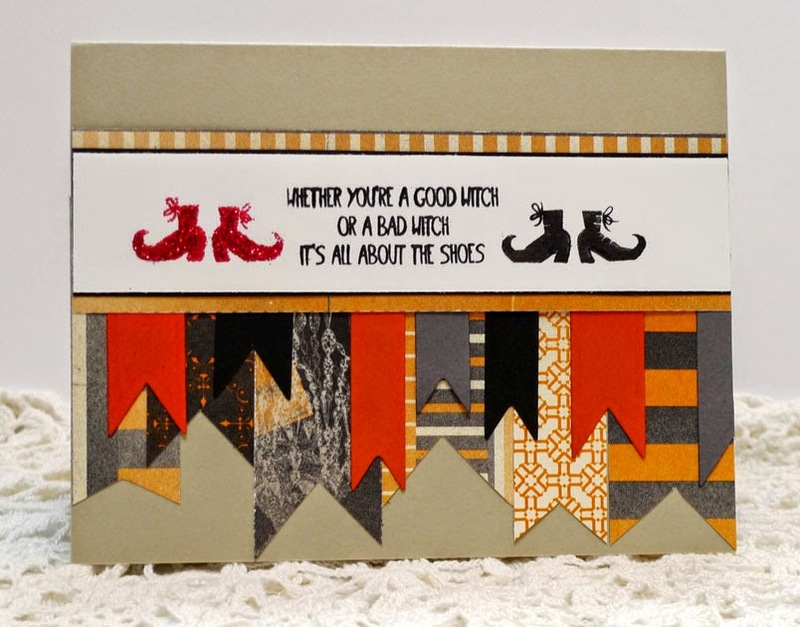 I used Stampin' Up's retired Romantic Red glitter on the one pair of shoes from the new holiday mini set Tee Hee Hee. All supplies are SU, some retired since I haven't bought any of the new Halloween paper yet. 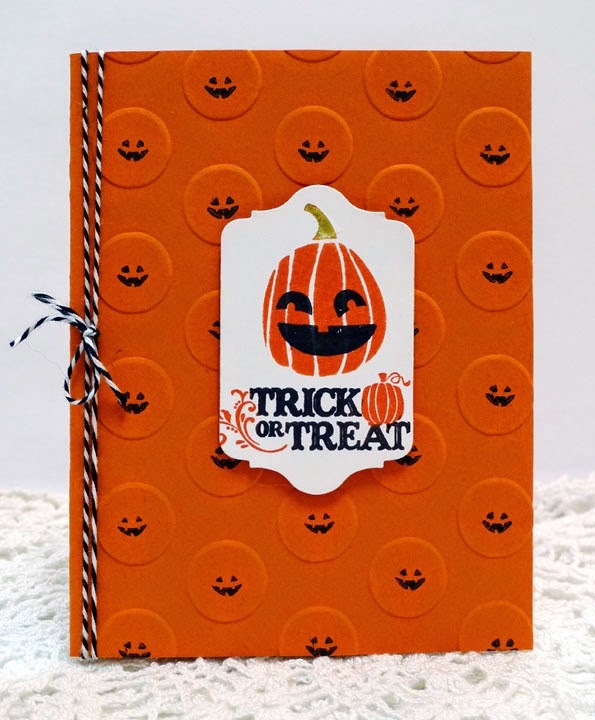 A pretty simple card using the new large polka dots embossing folder, little faces from the Holiday Home set stamped in the middle of each circle, black baker's twine, Chalk Talk framelits die, Fall Fest pumpkin. 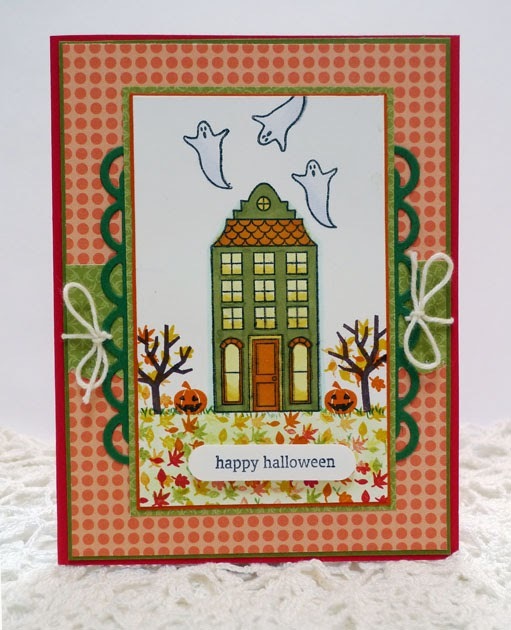 Trick or Treat sentiment is from the retired Holiday Best set, one I love and will never part with. I love the fonts on these. All Stampin' Up! Stampin' Up! Holiday Home stamp set colored in markers with some retired designer paper, Real Red, Olive, and Tangerine cardstocks. Stampin' Up! Kinda Eclectic stamp set stamped in various fall colors and then lightly spritzed with water before stamping onto watercolor paper. For the Curtain Call Lovely Leaves challenge. Stampin' Up! 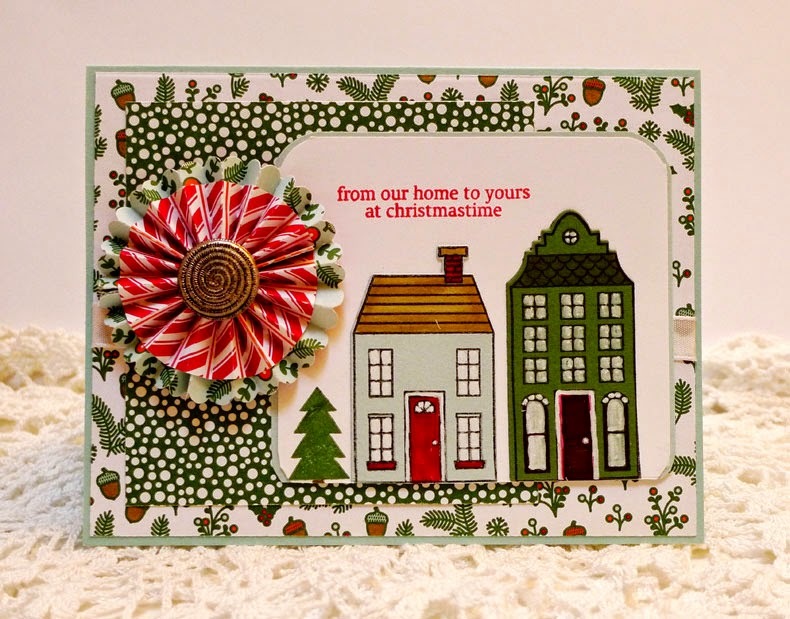 supplies: Nordic Noel paper, Holiday Home stamp set and coordinating dies, Soft Sky, Garden Green, and Whisper White cardstocks, markers, chalk marker pen, rosette made with the same designer paper and I added a vintage button from my jar (not SU). This is for the Mojo Monday sketch challenge.